Funny Yellow Dog. Italian christmas symbols charm. This Funny Yellow Dog is eager to be your friend! The face of the link features a charming animal extending a friendly paw painted in yellow and gold enamel over a sparkling stainless steel support. Get an image of your animal friend on the bracelet or create your collection of charming animals. Start with Gold Dinosaur or Yellow Turtle Italian charms of the same design and tone colors for a perfect look on your bracelet. A Choc Chow has a keen intelligence, an independent spirit and natural dignity. This Italian Charm portrays this delicate creature by showing a gorgeous cinnamon and white colored Chow Chow that is very fluffy. This charm will add personalization to your collection, because now, with our new and unique Custom Photo Charm, you can add you very own dog’s name to the top of this charm. It is backed by stainless steel. Pictured on this Italian charm, is a fawn-colored Great Dane that combines dignity, strength and elegance with immense size along with a powerful, attractive, and muscled body. On top of this charm will show the name that you choose, to give it a personalized feel. It is backed by stainless steel. The Miniature Schnauzer, shown here, has a hard, wiry, outer coat that is colored with a beautiful salt and pepper outer-coat. As an owner of this pet, you surely know that some of the Miniature Schnauzer's talents include hunting, watchdogging, tracking, competitive obedience, and performing tricks. 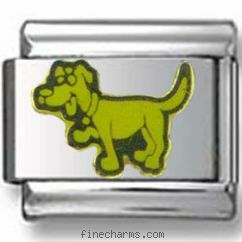 You will also love how we adorn these charms with the name of your own pet, to give your collection a custom-made touch.